Netflix is broadcasting Woody Harrelson’s movie, “Lost in London”, originally streamed live on January 19, 2017. The movie was broadcast as it was being filmed. 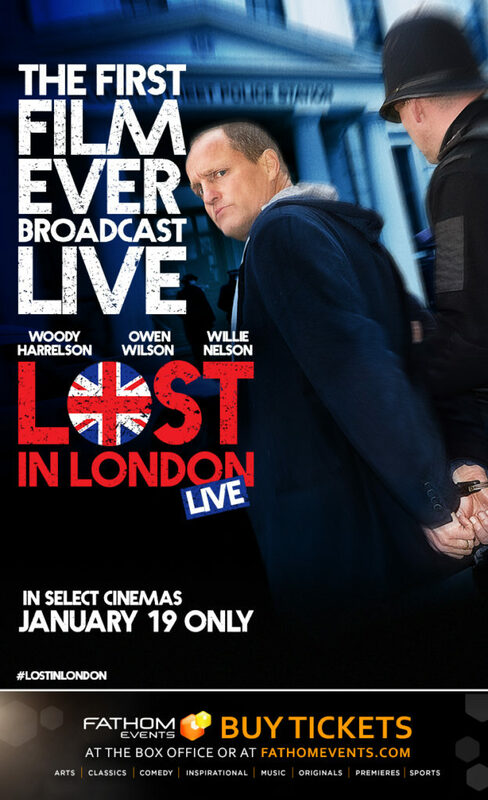 DENVER–(BUSINESS WIRE)–Academy Award® nominated actor Woody Harrelson will direct and star in an unprecedented live feature film event, “Lost in London LIVE,” on January 19, 2017. Harrelson, who wrote the feature film “Lost in London,” will also co-star with Owen Wilson and Willie Nelson. Ken Kao of Waypoint Entertainment will produce alongside Harrelson. This first-of-its-kind film event will screen live in U.S. movie theaters, giving audiences the unique opportunity to watch a film shot in real time. Loosely based on a crazy night full of real-life events, “Lost in London” follows Harrelson, playing himself, as he struggles to get home to his family. Run-ins with royalty, old friends and the law all seem to conspire to keep Harrelson from succeeding. “I’ve always loved theatre and film and wanted to find the best way to merge the two. When I decided to shoot this in real time I realized it wasn’t quite like true theatre because the one piece missing was a live audience. By broadcasting the film live as its being shot I hope to truly blend the excitement of live theater with the scale and scope of film,” said Harrelson. This entry was posted on Tuesday, May 29th, 2018 at 8:47 am and is filed under Movies, Videos, DVDs. You can follow any responses to this entry through the RSS 2.0 feed. You can leave a response, or trackback from your own site.